GOOD FOR CLASSES, HEALING ARTS AND MORE! Call or stop by the studio to purchase a holiday gift certificate in any amount. The Yoga Center of Haddonfield welcomes students of all levels of experience, age and body type. We offer several styles of yoga that are appropriate for beginners, intermediate and advanced practitioners. Our studio is guided under the direction of Darlene DePasquale, who has over 25 years of in-depth meditation and yoga practice. 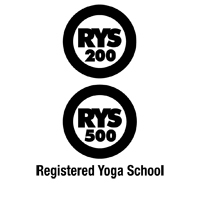 The Yoga Center is a Yoga Alliance Certified School offering a 200-hour and a 500-hour Yoga Teacher Training program. Whether you are looking to deepen your own practice or to share the joy of yoga with others, our program is a comprehensive training that offers a complete yoga experience. Located in lovely downtown Haddonfield for more than 17 years, the Yoga Center is open 7 days a week and offers over 20 classes per week. If you would like help in choosing the best class to attend, simply call the Studio and schedule a FREE PRIVATE TOUR and FREE 10-Minute Consultation. 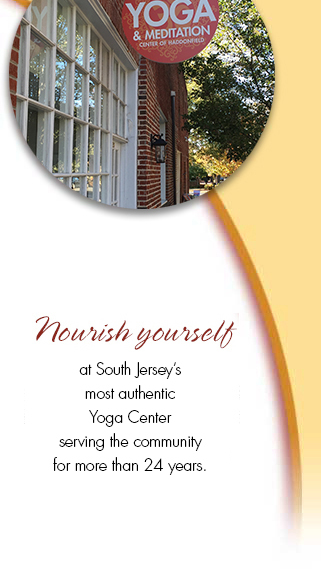 Or if you would like more information, call the Yoga Center at (856) 428-9955. Directions to the Studio are available on our Contact page: Click here. SUNDAY, APRIL 21, The Yoga Center Will Be Closed. Join us in 2018 as we use our chair to learn how to focus - aligning our breath with stretching to improve posture, flexibility and balance! Chair yoga is for beginners, seniors and anyone who wants to explore new ways of practice!! Take the series, or drop in for a single class. The founder of Reset Relief which incorporates yoga, meditation and Integrated Positional Therapy. CEU Credits for yoga teachers. Sign-up early ~ this workshop will fill quickly! Our STYLE FRIDAY events are held on the last Friday of the month. Each event focuses on a different aspect or style of yoga. It's a great way to learn new information and to experience different yoga styles. If you are new to yoga, this is a great opportunity to meet teachers, experience yoga and explore the studio. STYLE FRIDAYs are very popular and can fill quickly. Friday Style events are held at a NEW TIME —7:30 p.m. - 9:00 p.m. and are open to all. This is a great way to introduce yourself to different yoga styles and teachers. The cost is $5.00. There is no Style Friday class in April. To download and print our CLASS SCHEDULE (PDF), click here.